Powers: Jackson has the power of Hydrokinesis- allowing him to shape, manipulate and control water in his immediate vicinity. In addition to this he manifests webbed hands and gills when in contact with water. He can also release an electrical charge throughout his body. Since being born in the Bermuda triangle it has been theorized that he has the additional power to unlock the Xebel prisons found there. 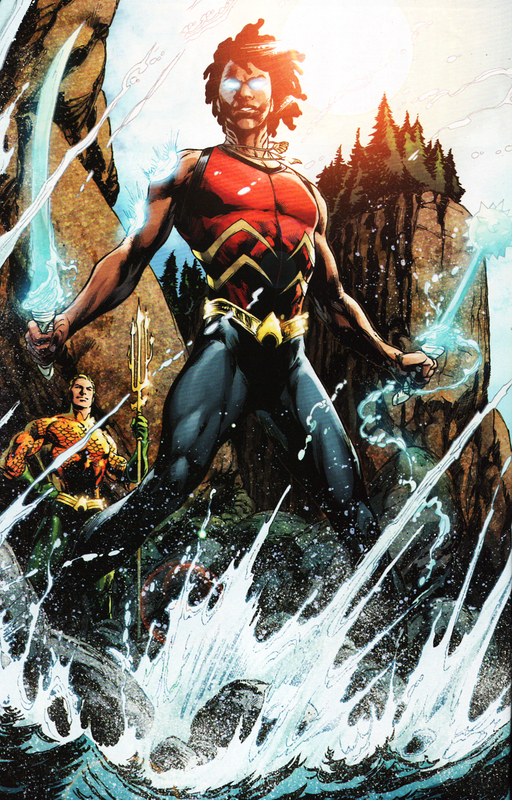 He also possesses weapons called “water bearers” which allows him to better focus his powers. Jackson’s mother was abducted in the Bermuda triangle by Xebel forces (a rogue fanatic sect of Undersea people who can manipulate water). They performed experiments on his mother and him and she died while undergoing the process. The experiments gave him the power to release them from there prison but eh was stolen by princess Mera who took him to his Aunt and Uncle in New Mexico. As he grew up he was warned to never come in contact with water but as he grew older however he eventually did and manifested powers. His adopted dad took him to a place containing a treasure also left by Mera and his biological father Black Manta and Aquaman showed up and battled for the boy. Traveling with Aquaman he learned of his heritage and his destiny as prophesied in the Aquawar. He joined with the rest of the Aqua-family to battled Black Manta and the Xebel Forces. It was he who successfully sealed the dimensional breach thus ending the threat to the world. Although I liked the cool one that is on young justice I feel they could’ve just made up a completely different underwater black character. Besides when was the last time anybody herd a black person say lad?! ?